Bling Your Booth Winners Revealed! Our first-ever “Bling Your Booth” Challenge has come to an end, and we must admit—we were blown AWAY by the effort and creativity shown by Girl Scouts across the nation. With booth themes ranging from “Cookie Winter Wonderland” to Super Bowl XLIX to “Peace, Love, and Girl Scouts,” girls really went the extra mile to attract cookie customers all season long! We couldn’t be prouder of the 1,600+ troops who participated and made this year’s Bling Your Booth Challenge a wild success. Now that all votes are in, we’re proud to announce the six troops whose booths really take the cake (or shall we say “cookie”). Drumroll, please! Troop 68100’s Cookie Winter Wonderland Booth came equipped with gum drops, lollipops, snowmen, and of course, Girl Scout Cookies!! 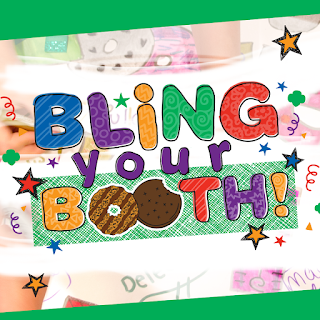 This bling’d-out booth was the secret weapon that helped them reach their goal of selling 14,500 boxes of cookies. In celebration of the Samoa’s 40th birthday, this troop went all out for the caramel and coconut treat Americans crave. Their Cookie Cabana featured a surfboard that tracks their progress in meeting their sales goals, plus all the beach accessories you need for a day on the water. The girls also decided to expand on their Philanthropy badge by hand delivering cases of cookies to local military families, children who are ill, and the local police department that recently lost an officer in the line of duty. With the theme "It's COOKIE Time!” Troop 3149 used their bling’d-out booth, which featured unique hand drawings and a flashy zebra-print banner, to help them reach their goal of 2,700 boxes sold. With their earnings, they plan to purchase tickets to a Shawn Mendes concert this summer. How exciting is that? The girls of Troop 4688 decked out their patriotic-themed cookie booth in red, white, and blue, paying tribute to the soldiers who fight to keep this country safe. Of course it was a big hit for this Texas troop, and they plan to send 200 boxes of cookies to troops overseas. Welcome to Cookie Land! What better way to celebrate the Super Bowl than with the best game-day snack of all? Troop 3623’s bling’d out their booth with festive balloons, photos of their favorite cookies, and decorative “candy” made from balloons, all in celebration of the big game. Troop 273, with assistance from their “cookie dads,” created a cookie-themed booth featuring handmade cookie costumes and girl-made cookie decorations. The girls’ creativity helped them reach their goal of selling 250 boxes each. Again—huge CONGRATS to all the winners of this year’s Bling Your Booth Challenge, and an even bigger THANK-YOU to everyone who participated. It’s wonderful to see the talent and creativity of the members of our amazing Movement.